I was just informed by my friend Bob (he is always looking out for me) that today is National Tequila Day here in the United States. This could be serious. Combine all the ingredients in a shaker with ice cubes, and shake like mad. Strain into a cocktail glass garnished with a salted rim (optional). 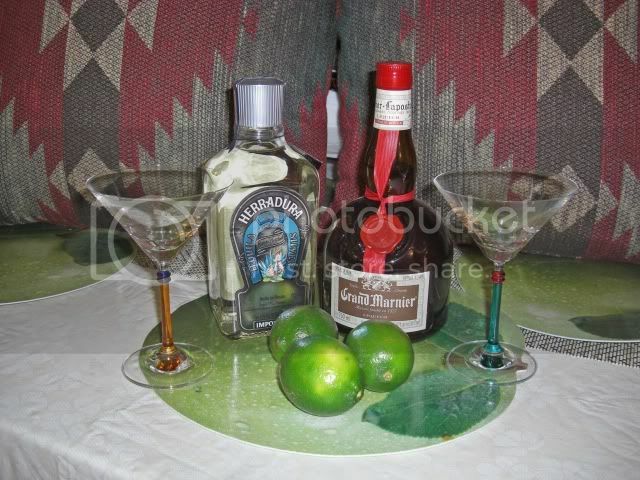 I prefer a good Tequila blanco (or silver), but be sure it is good and 100% blue agave. A reposado will work as well, but save the anejo for sipping. By law tequila only needs 51% of the fermented sugars to come from blue agave. These are labeled mixto, but avoid them at all costs. No self respecting Mexican would ever drink this and it is almost all shipped to the United States or used in frozen margaritas that are sold to tourists in Mexico and college students here. Or sometimes to Bar Man. I had a Margarita, three actually, at Braeburn's the last time I was there that were made with a light Mezcal. Gave them a nice smokey taste. Of course there are thousands of recipes for margaritas and more and more tequila based cocktails are popping up. For something different, try a nice anejo (aged) tequila in a brandy snifter and just sip it. 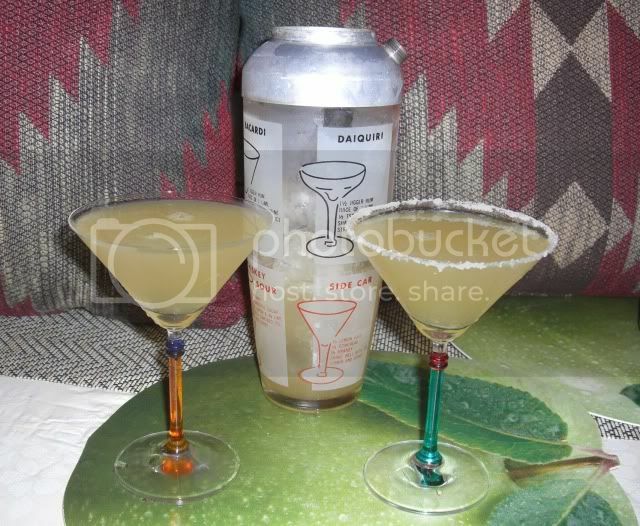 Okay, after giving you my perfect Margarita recipe I had to modify a bit. I went to my local liquor store and not only did they not know that today was National Tequila Day, they were out of Cointreau. Can you imagine that? I ended up buying a bottle of Grand Marnier, which is a good substitute but, ah, what can you do? They do carry one of my favorite tequilas, though, Herradura. I usually drink this when I am in Mexico and Esquire magazine just rated it very highly as well. If you are in Mexico, just say air ah doo rah, and try to roll your Rs. Kind of requires you to make a motorboat sound with your tongue. 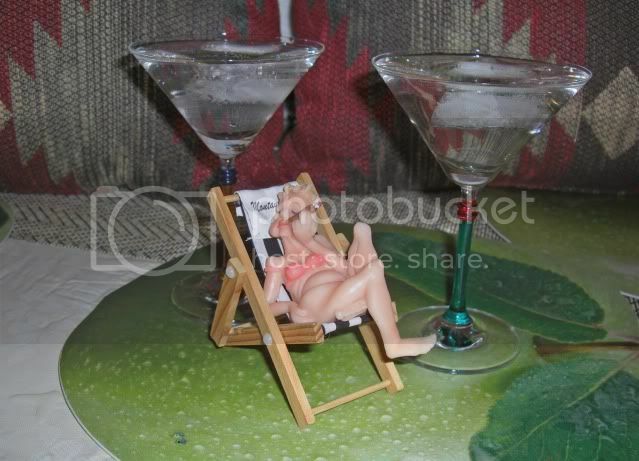 Most cocktails are best straight up and icy cold so I always like to chill my glasses. Make sure your freezer is turned down as low as you can get it. Unlike boiling water which can only get so hot, ice can get as cold as cold can be. And the colder the better. That gal in the chair always reminds me of my sister, Paula. But that is another story. With everything assembled I mixed up two Margaritas, one with a salted rim for me and one without for the Mysterious Chinese Woman. 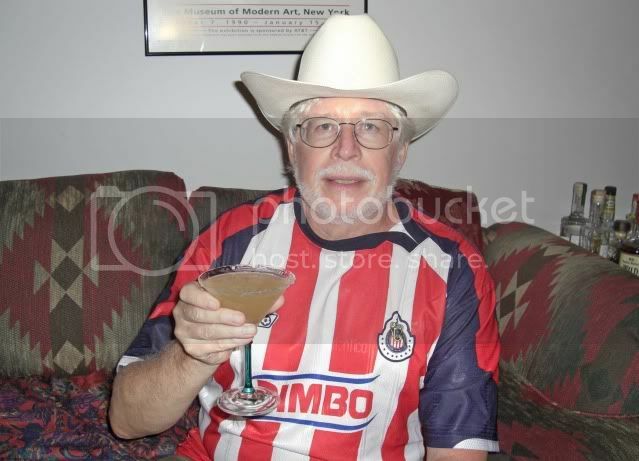 I, of course, had to don my Mexican apparel before sitting back to enjoy the efforts of my work of love. Only about six or seven months and I will be back in Mexico again. Next week, however, the Mysterious Chinese Woman and I will be up in Quebec for a couple of weeks to see the International Fireworks Competition. Or at least some of it. It runs for three weeks and we will just be there for two to see three nations display their finest and the grand finale. I still have to laugh at the interesting turns life takes. When I bought my place in Downtown Brooklyn it was a bit of a seedy neighborhood. Atlantic Avenue wasn't someplace you felt comfortable walking at night, especially to the east. Smith Street was pretty much all bodegas and social clubs. The area that is now Dumbo was positively desolate after dark. And now, tour buses pass by my building. Of course I also lived at the Gramercy Park Hotel for almost a year when I first moved to New York and drank at the semi-dive bar there where the hookers used to take their breaks and ply their trade. Once I ordered a rum and coke and jokingly asked the bartender to leave the bottle. And he did. Now that bar is the Rose Bar and you need a reservation to get a drink. Yesterday was a nice day, warm and sunny. 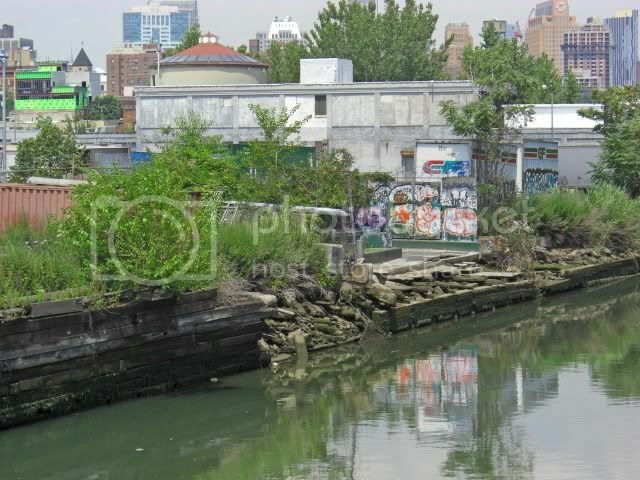 A perfect day to head over to the Gowanus Canal and take a few pictures. 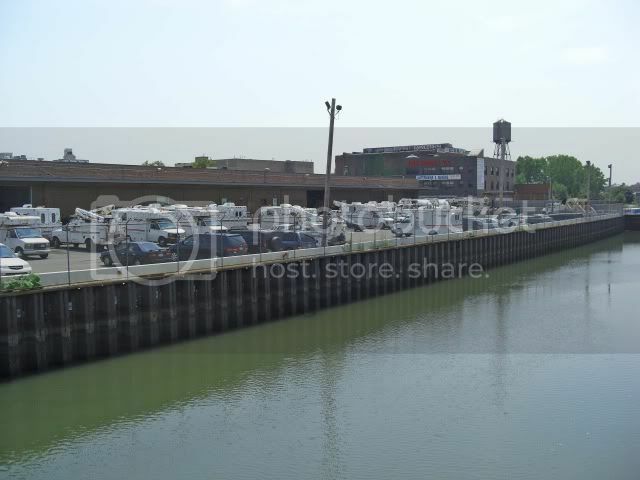 I headed up Smith Street, our local Restaurant Row, until I got to the Gowanus Yacht Club. 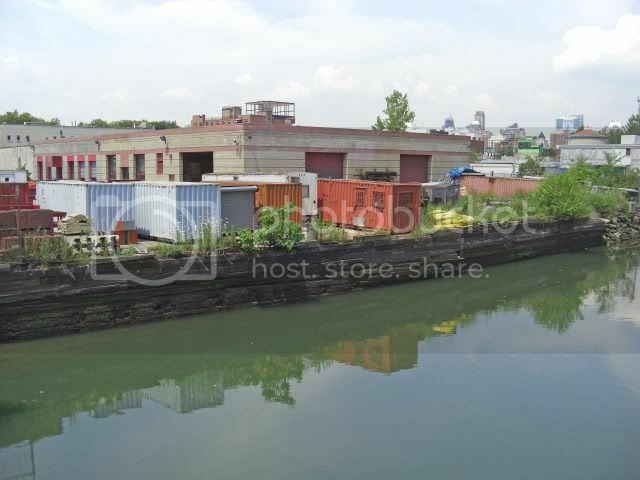 It doesn't open until later in the day and is several blocks away from the Gowanus Canal. 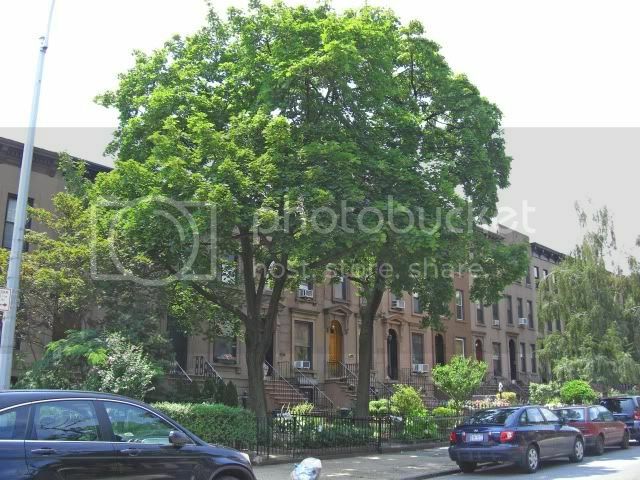 I headed east on President Street and strolled down a ovely tree lined street. 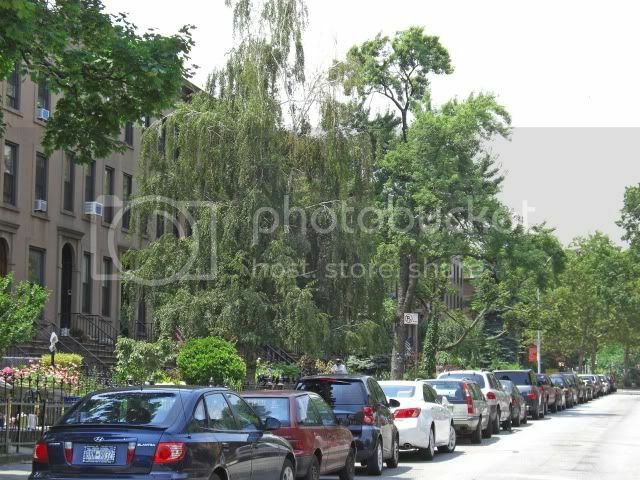 That tree lined street only runs for a couple of blocks though, and then it dead-ends at a parking lot and storage yard for Verizon trucks. 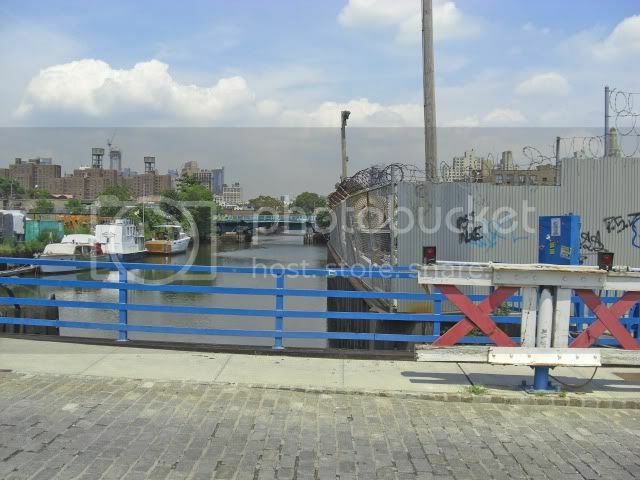 This blocks access to the Gowanus Canal at this point. 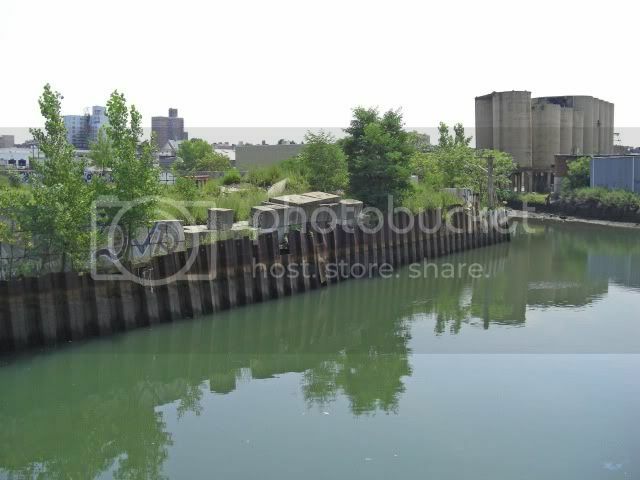 In fact, there are very few places where you can actually get to the Gowanus Canal. There are several bridges across the canal though for both pedestrians and automobiles. These pretty much provide the only vantage points to take pictures unless you want to risk getting caught trespassing. There are a few boats moored in the canal. 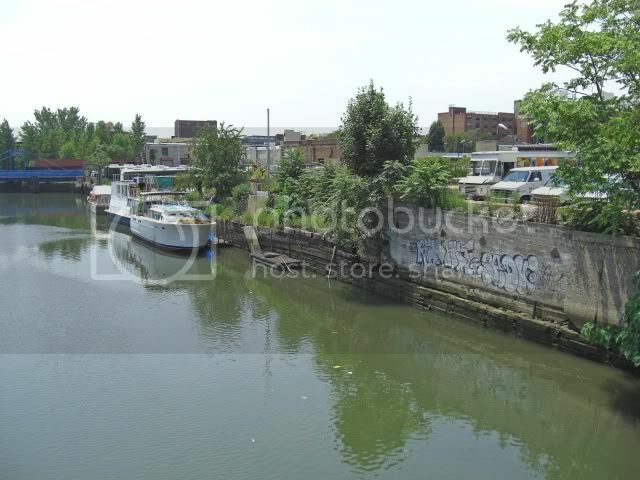 But, as you can see, the canal is pretty much solidly lined with storage yards, vacant lots, and various manufacturing concerns. Oh, a bit of trivia. Did you know that graffiti is from the Italian graffio, which means "a scratch"? 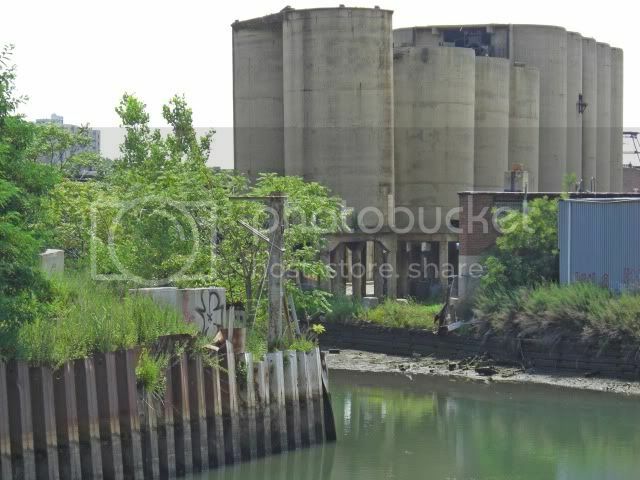 Grain Silos Or Cement Storage? 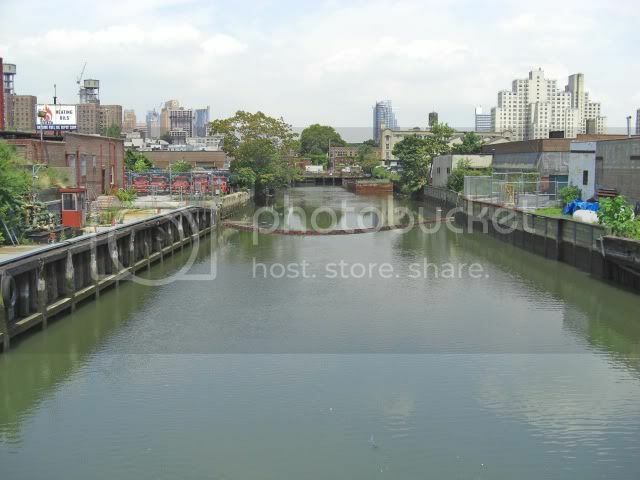 This Gowanus Canal was originally completed in 1869 and was the result of dredging the existing Gowanus Creek. 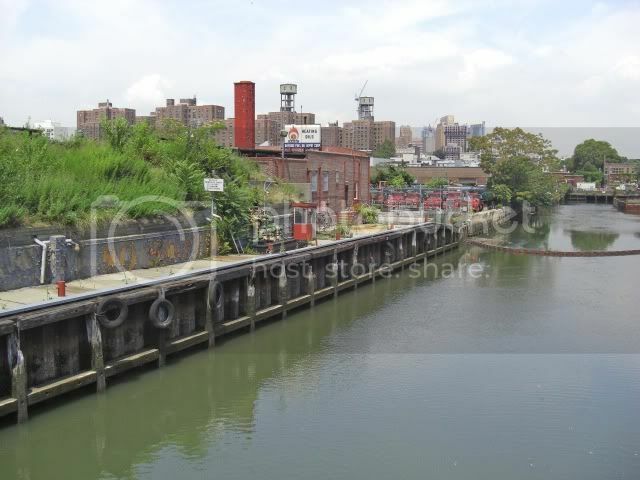 Even though it is relatively short, it did provide access to and from New York Harbor. 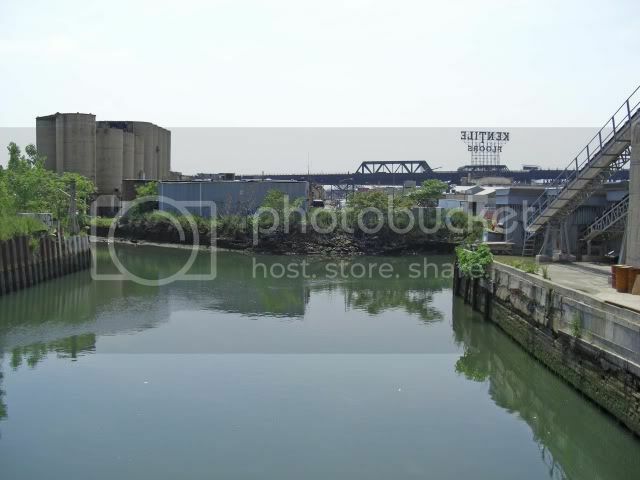 As a result the Gowanus Canal was a hub for Brooklyn's maritime and commercial shipping activity. Factories, warehouses, tanneries, coal stores, and manufactured gas refineries sprang up as a result of its construction. 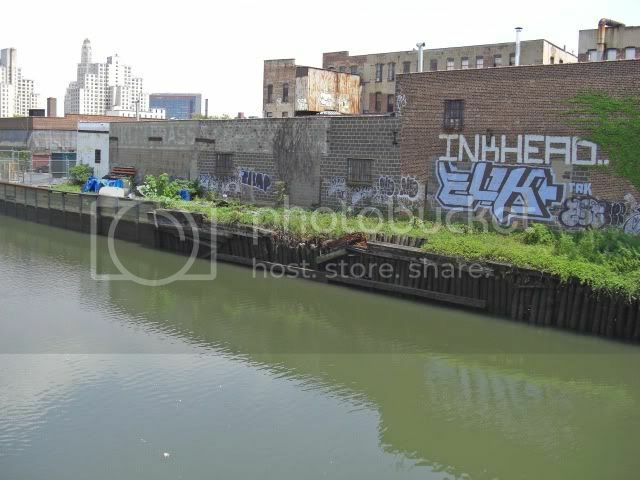 Of course the Gowanus Canal no longer serves its original purpose, but the old manufacturing nature of the neigborhood remains and the canal is now more of an eyesore than anything else. A smelly eyesore with a lot of potential and an endless topic of political debate as to its future. CNN is interviewing Rudy Giuliani asking how he would help prevent future terrorist attacks on the United States. Am I missing something here? In 1993 the World Trade Center was almost brought down when a car bomb was detonated below the North Tower. It failed, just barely, to bring down the tower, but six people were killed and 1,042 people were injured. Yeah, that is right, over one thousand people were injured. But you probably forgot all about that. The North Tower was completely shut down for over a year. Also as a result of the loss of electricity most of New York City's radio and television stations lost their over-the-air broadcast signal for almost a week, with television stations only being able to broadcast via cable and satellite via a microwave hookup between the stations and three of the New York area's largest cable companies. Telephone service for much of Lower Manhattan was also disrupted. Now, knowing how vulnerable the World Trade Center was to an attack, and knowing it was a prime target of Al-Qaeda, tell me again what, exactly, Rudy Giuliani did to prevent a second attack eight years later. Or what he did to minimize the impact of a second attack? And why is he now considered an expert on preventing the very type of attack that occured when he was Mayor? Now, don't get me wrong. I am not sure if there is much, if anything, Giuliani could have done to prevent the attack, although I think there is much he could have done to minimize its impact. But I just don't know why being Mayor when the attack occured makes you an expert on preventing another one. Again, Bar Man is confused. But, I promise, tomorrow I will have more kvetching. This time with pictures. The Gowanas Canal is now the object of my wrath. The weather looks pretty good so far today so I am going to try to get out a take a few pictures of the Gowanas Canal. First, though, I thought I would give you another example of how New York moves along on its projects. There was just an article, again, in the New York Daily News, saying that the completion of the first section of the 2nd Avenue Subway Line is now being postponed until Late 2016 or early 2017. 1920 - The idea of the 2nd Avenue Subway Line is first floated. By the way, that December, 2016 target date is only for the first phase of the line, three stations at 96th, 86th and 72nd Streets and then hooking into the existing subway network. This would be amusing if it wasn't so sad, and so typical. Meanwhile you have the same old thing; at least a dozen businesses along the proposed line have closed because of the ongoing construction and others are having a difficult go of it. New York, you got to love the place. Oh, and does anyone want to hazzard a guess as to when the new line really opens? If you say December 2016, well I live really close to a bridge that is for sale. The other day I posted about the article in the New York Daily News that claimed "A new study shows a staggering 80% of all car accidents and 65% of all near misses are caused by distracted drivers being more focused on their burgers than on the road." Interestingly, a new study conducted by the National Highway Traffic Safety Adminstration says that: "...motorists talking on a phone are four times as likely to crash as other drivers, and are as likely to cause an accident as someone with a .08 blood alcohol content. One can only assume that a lot of people must talk on their cellphones while also eating and intoxicated. Actually, that might account for some of those late night phone calls I get. Lousy "summer" day today. 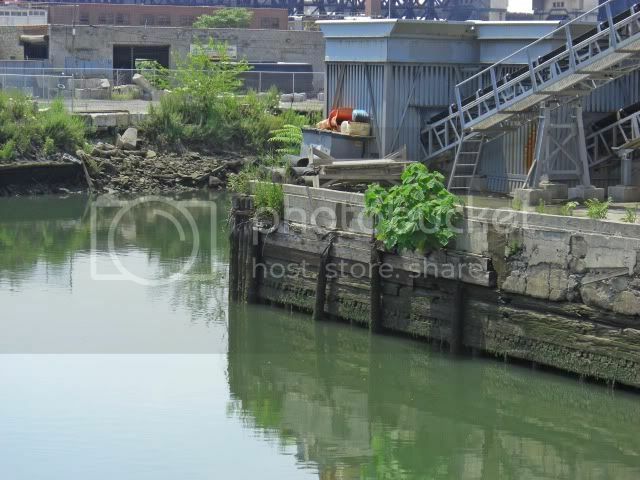 Currently 64 and rainy so I don't know if I will be getting out and about to take pictures of the Gowanus Canal. We shall see if it clears up later. Of course the reason that nothing get done, or is likely to get done soon, is the incredible cumbersome political process that we have here in New York. A couple of articles in today's New York Daily News just reinforces that. 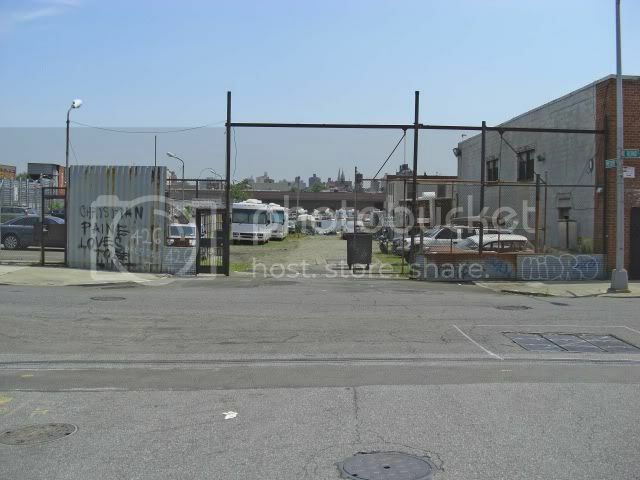 First, we have the mess that is the building on the site of the former World Trade Center. A supposedly high priority project to restablish our pride in America. Of course there is still nothing there but a muddy hole as various agencies bicker for control and money. 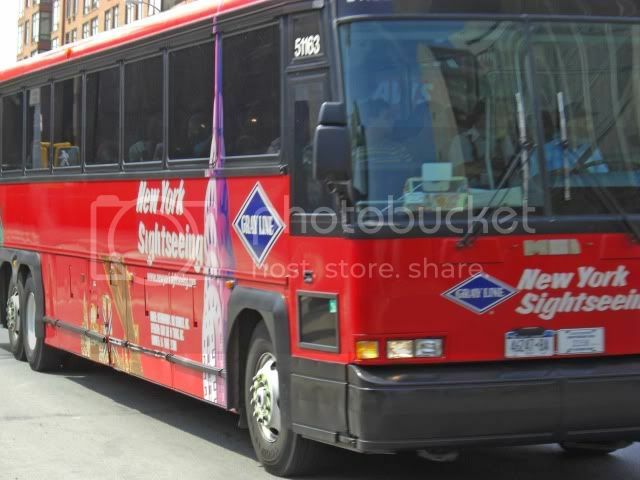 Today's article announced that the Governor of New York is now trying to resolve the dispute between the Metropolitan Transit Authority and developer Larry Silverstein to resolve their conflicts so that development can begin. The primary issue is what will get built on the 16 acre site and who will pay for it. What will get built? This nearly eight years after the World Trade Center was brought down. The second article concerned Coney Island where proposed redevelopment has been on hold for years and meanwhile Astroland has left, Ruby's Bar & Grill never knows from one year to another if it will re-open, and there are acre's of, while, acres of nothing. And this is beautiful beachfront property. The story, "Pol warns: I may kill Coney deal." What a surprise. Unless the city funds improvements to a hospital in the area and makes other, unspecified, concessions a Brooklyn city councilman who represents Coney Island is threatening to kill the whole plan. Two of many examples of how nothing seems to get done here in New York. Cold rainy days make Bar Man cranky. This startling and somewhat unbelievable statistic was reported in the Sunday's New York Daily News article "Eat-&-drive sure recipe for a crash." "A new study shows a staggering 80% of all car accidents and 65% of all near misses are caused by distracted drivers being more focused on their burgrers than on the road." The upshot of the article is that eating or drinking non-alcoholic beverages, especially hot coffee, while driving is the contributing cause of 80% of all automobile accidents and, by the way, 65% of all near misses. Now first of all, who keeps statistics on near misses? Do people pull over to the side of the road after a near miss, wait for the police to show up and then admit to eating a hamburger or drinking a cup of coffee while driving? I don't think so. And 80% of all accidents? Why are we banning the use of cellphones and texting then? Hell, if we believe that statistic then driving while intoxicated isn't as dangerous as eating while driving. Sometimes you read something in the paper and just have to shake your head in disbelief. Sometimes the editor should do the same.